Transport layer security (TLS) is not an easy topic. Many blogs have been written about this already. 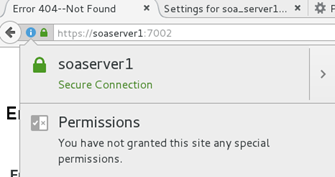 Surprisingly though, I did not find a single blog which was more or less complete and provided me with everything I needed to know to get this working on SOA Suite 12.2.1. In this blog I try to make the topic more easy to understand and provide a complete end to end example. Suppose you only want an implementation and do not care much about the explanation, you can skip the ‘Some basics’ section, only execute the commands in bold in the ‘Lets get started!’ section and the steps in the ‘WebLogic and SOA Suite’ section. Do take into consideration any existing SSL related configuration on your own system. SSL stands for Secure Sockets Layer. SSL is the predecessor of TLS. SSL should be considered insecure since in October 2014 the POODLE attack was announced. TLS currently has 4 versions. TLS 1.0, 1.1, 1.2 and 1.3. 1.3 is not widely supported/adopted yet. SSL/TLS provide integrity checks, security and authentication. A server which hosts traffic on a port which has SSL/TLS enabled, has an identity keystore. This identity keystore contains a private key and a public key/certificate. The public key/certificate can safely be given to other parties. With websites when visiting an HTTPS website (HTTP with SSL enabled), the public key is send to you. The other party / client can use the public key to encrypt messages meant for the server. The only one who can decrypt the messages is the one having the private key of the server. This is usually only the server. Read the complete article here.